Today was the kind of day I am anticipating much more of while the other lunching half is away. I left the office at 10:30am for meetings and at 5:30pm, finally made my way back to a pile of untouched work. Luckily, there was a 40 minute window between the meetings for a proper lunch. Having been on a fried fish kick of recent, I thought about going for a Fish Friday at A Salt & Battery, but instead crossed the street out of sheer curiosity to Soy Luck Club. I had the #8 Sandwich - Tofu Salad, Avocado, Soy Mayo, and boy was it delicious! 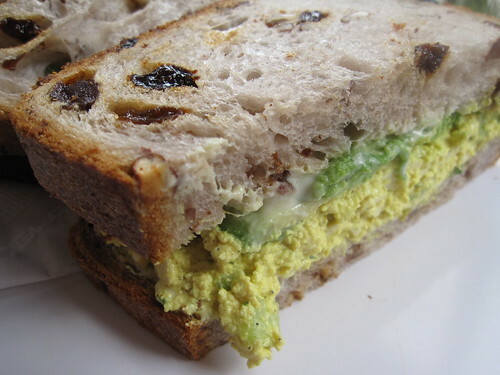 The bread is similar to the one at Aroma, nicely soft and chewy, and the raisins were a lovely complement to the curried egg salad-like tofu salad.